Let's talk about gloves. 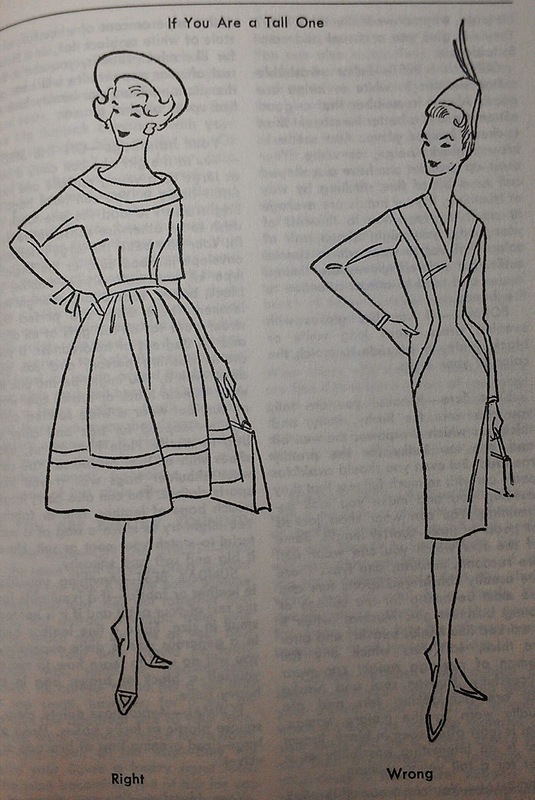 This is adapted from "How to Sew" by Mary Lynch and Dorothy Sara, copyright 1960. String gloves were popular in wool, cotton, nylon or rayon. Yellow, beige, or any natural color was worn with sports or riding clothes. Alternates for sports clothes are woolen gloves or mittens. "They are especially smart in black for a woman and in bright colors for teenagers." Double woven fabric, made from cotton is very thick and smooth and can barely be distinguished from suede leather. It can be washed, so it is more practical. Chamois can mean either natural creamy yellow color, or the actual chamois leather. Kid, glace kid, and glace are thin, smooth surfaced leather gloves. Fine kid has a gloss but is not usually so rich and luxurious looking. Pigskin is exactly what it says. Pigskin gloves are worn with sports, tailored and casual clothes. Ostrich, reindeer, and capeskin are also used for everyday wear. Suede and mocha are soft, velvety leather. Doeskin is similar to suede and mocha, but of lesser quality. Some doeskin gloves can be washed, but white doeskin will yellow after a few washings. Most leathers tend to stiffen with washing. Black sueded is lovely, but prone to "cracking" (rubbing off on your clothes). For petite women, "shorties" (gloves that come just above the wrist) are the perfect length, in slip on, or one button style. Wear them to match your outfit, or as the only contrasting accessory - don't match gloves to purse to hat. "If You Are a Tall One": "your gloves- on the street -- fabric or leather gloves in slip-on or gauntlet (wide flared top) style are best for you. If you like sports clothes, tweed suits, or loose swinging topcoats, you may wear your gloves in a half size larger than your wee bit sister. If you like your gloves, bags and other accessories a bit large, why not wear them that way? This will give you a casual and comfortable air." Correctly shown in the illustrations on the left. If you are tall, you should apparently not go gloveless, as the "wrong" illustrations on the right show no gloves. Perhaps flu season would go better for us if we went back to wearing gloves? I'd be ok with this, as I love gloves. All in favor, raise your (properly gloved) hand. My dermatologist also said she wishes that gloves would come back into fashion. We wash our hands so often that sunscreen applied before leaving the house doesn't do the trick; then she has to remove the pre-cancerous damage to the backs of our hands. 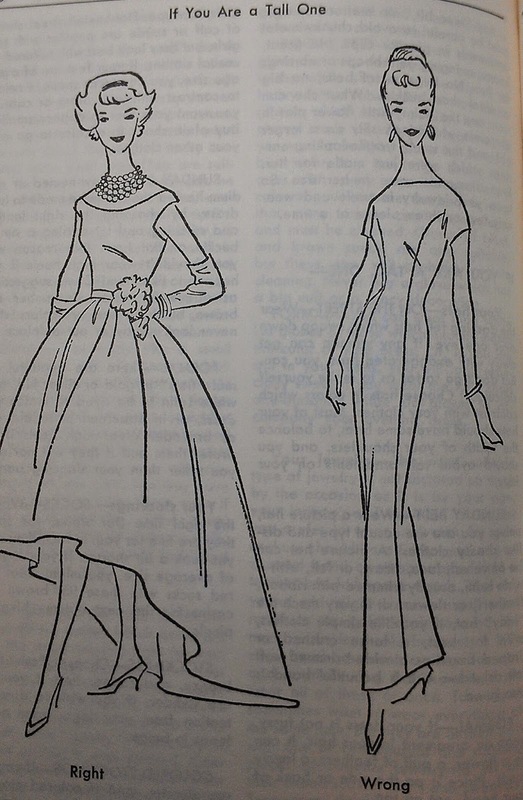 The book, "To Marry an English Lord", which ecounts the movements of the rich American girls of another era who traveled to England and beyond for husbands, notes: "Kid gloves were supposed to fit so tightly that the outline of the fingernails was visible; they lasted only for one wearing" (pg 93).